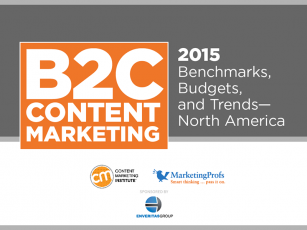 Two weeks ago, we released the Content Marketing Institute/MarketingProfs B2B Content Marketing 2015: Benchmarks, Budgets, and Trends—North America: the first round of findings from our annual content marketing survey. Now it’s time to learn what B2C marketers have to say about their content marketing practices in our B2C Content Marketing 2015: Benchmarks, Budgets, and Trends—North America report, sponsored by EnVeritas Group. This is the third year we’ve reported on B2C and it’s been interesting to see how their use of content marketing has evolved. One of the key findings this year is that B2C marketers, like their B2B counterparts, are having difficulty measuring how successful their content marketing programs are. However, having a documented content marketing strategy can help. In response to a new survey question this year, we found that only 23% of B2C marketers believe they are successful at tracking ROI. In addition, measuring content effectiveness, one of the challenges that respondents rated the highest, rose from 36% last year to 51% this year. Click to tweet: Only 23% of B2C content marketers are successful at measuring the ROI of their #contentmarketing programs. While half of marketers say they have a verbal content marketing strategy, only 27% of B2C marketers have taken the time to put their strategy in writing. 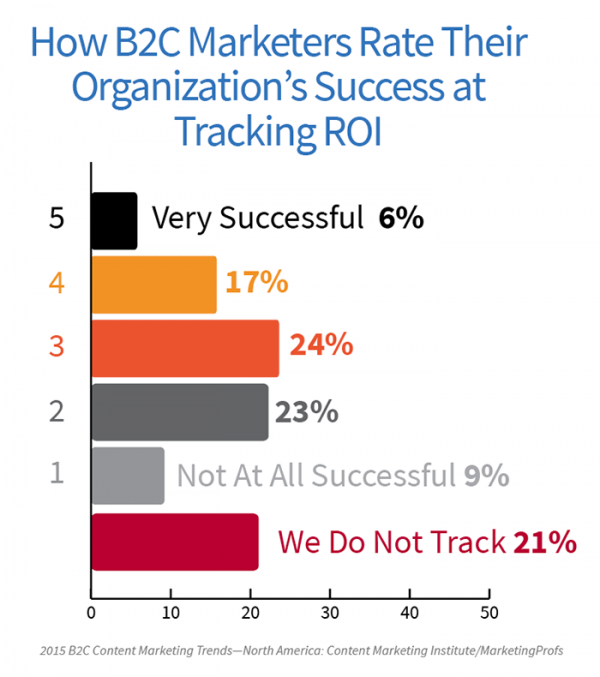 Of B2C marketers with a documented content marketing strategy, 43% say they are successful at tracking ROI (compared with the 23% cited for the total sample.) This is just one example of how those who have documented their strategy differ from their peers. Other attributes include: allocating more budget to content marketing, producing more content, and distributing their content more widely via social media. 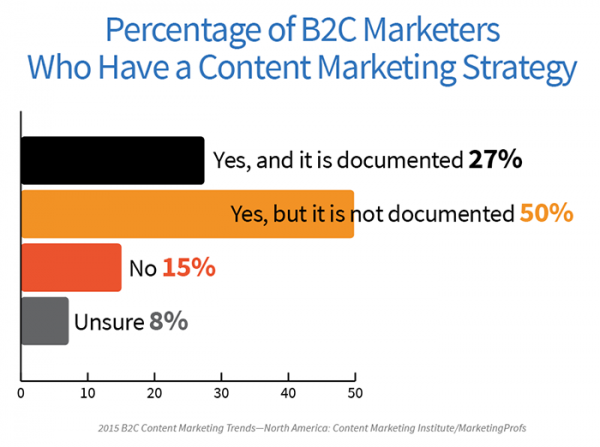 The key here is the same one we reported with the B2B report: If you want to be more effective at content marketing, put your strategy in writing. Click to Tweet: B2C marketers with a documented #contentmarketing strategy are more effective at content marketing. 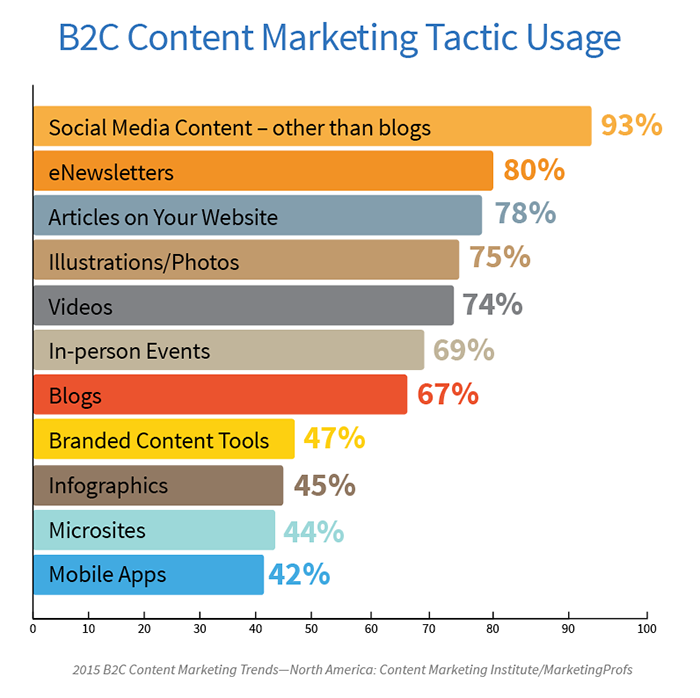 B2C marketers are using an average of 11 content marketing tactics. At least three-quarters of respondents use social media content other than blogs (93%), eNewsletters (80%), and articles on their website (78%). Use of blogs saw a decline this year, dropping from 72% last year to 67% this year. The tactic with the most growth is branded content tools (up 10 percentage points). Illustrations/photos, which 75 percent of B2C marketers use, was a new choice on the survey this year. Click to tweet: B2C marketers use an avg of 11 content marketing tactics. Social media content tops the list; blog usage has decreased. B2C marketers use an average of seven content marketing social media platforms to distribute content, up from six last year. 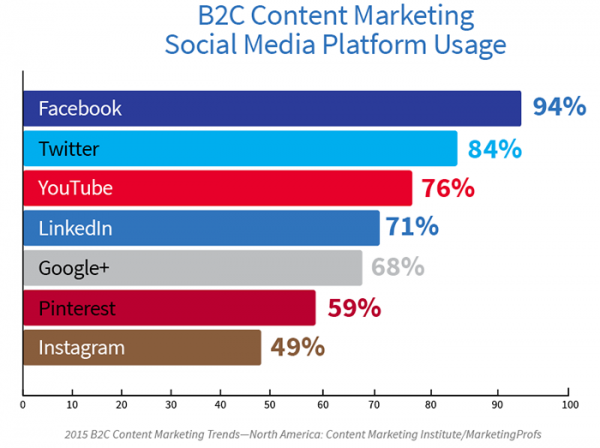 (They use more platforms than their B2B counterparts, who use an average of six.) Instagram and Google+ rose the most in usage this year (up 17 and 13 percentage points, respectively), with all platforms (except LinkedIn) experiencing some level of increase. 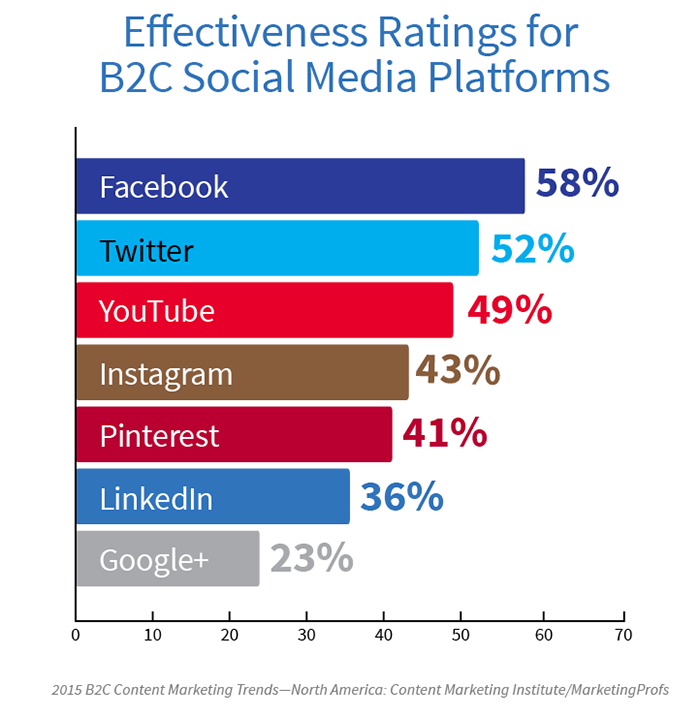 B2C marketers are increasing their use of social media platforms, but, as we see every year, not all users consider the platforms to be effective. While Facebook is still rated as the most effective platform overall, confidence in the platform slightly dropped (4 percentage points from last year.) The biggest increase in confidence was with Instagram (up 9 percentage points). Click to tweet: B2C marketers working on an average of 13 initiatives – better converting of website visitors is top priority. Click to tweet: In the next 12 months, B2C marketers to focus on mobile, marketing automation and measurement. Which paid methods do B2C marketers use to promote/distribute content? How many audiences do they target? Do B2C marketers plan to increase their content marketing spending over the next 12 months? What do you think of this year’s findings? Do you agree with them? Do you see anything surprising? Let us know in the comments! If you are interested in research, CMI has many more new findings coming your way, as well as explanations of the “whys” and the “what nexts.” Subscribe to our email so you don’t miss anything.